Mike Fudge is one of those toy customizers who captivates your attention immediately. Existing within each piece is craft, artistry and certain mystical elements that are not only seen but felt. KR Boulder recently sat down with Fudge for an exclusive interveiw. Read on to get to know this incredible artist rising above and beyond up and coming status. KRBLDR: What was your start into the art world you know today? MF: It wasn’t any one thing in particular, but a culmination of appreciating and wanting to do all kinds of different art. As a kid I would draw cartoons and comic characters, then later I was exposed to design and modern art movements. 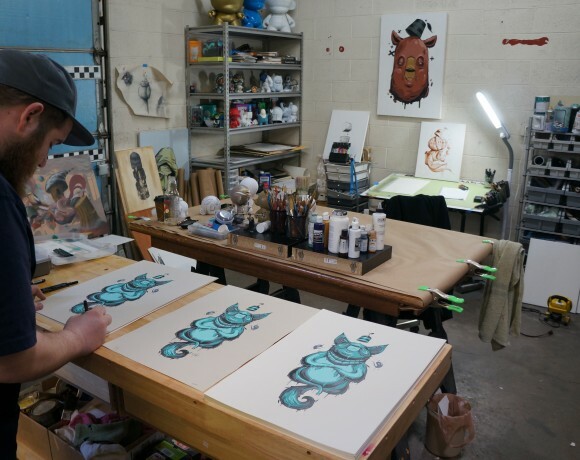 It was those things and much more that led to all kinds of projects and ventures to test my skill level and to see what parts of the art world made me happy to participate in. All of it together put me where I’m at now making many different types of artwork. 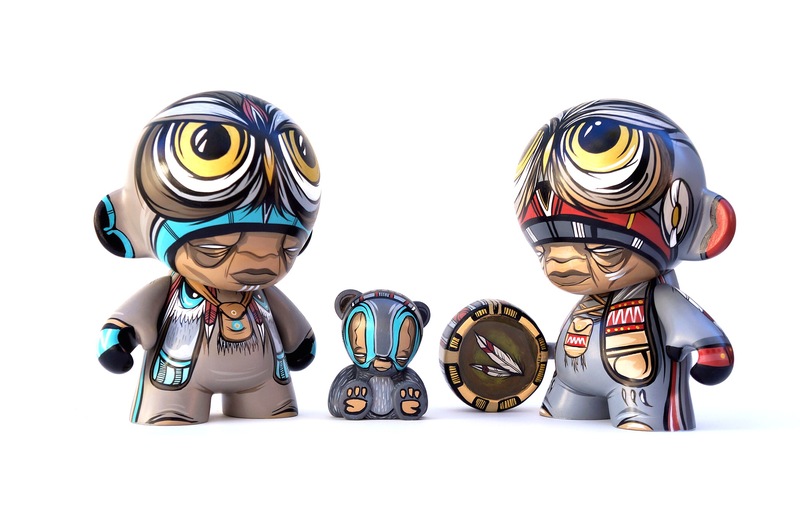 KRBLDR: The medicine MUNNY is a strong character in your toy work. While you may evolve from this, what is the meaning behind it for now? 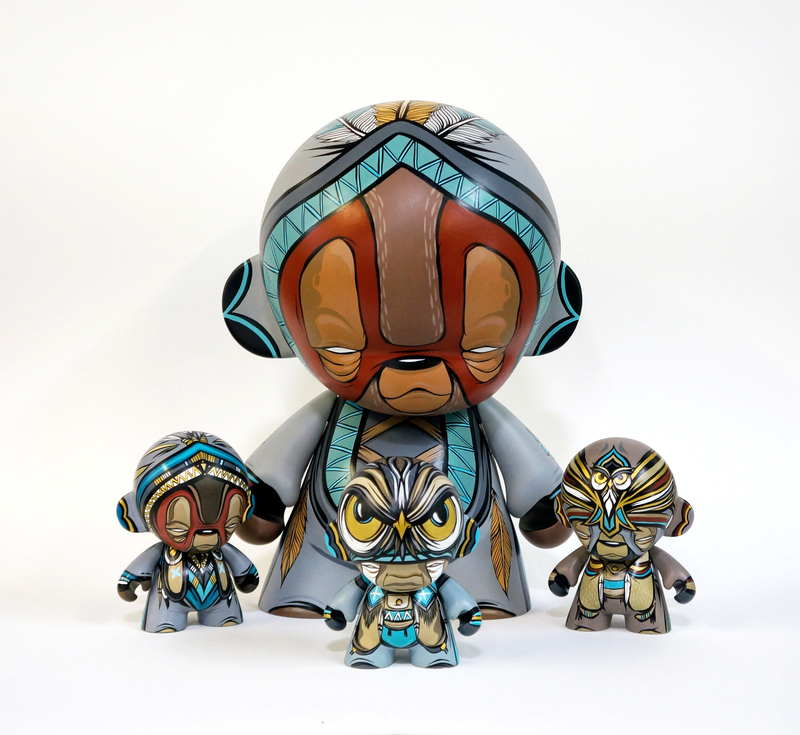 MF: The medicine MUNNY is my playful interpretation of a healer. Kind of like a sage or saint but maybe a bit more mystical and superstitious. They are the members of my tribes, bringing wisdom, hope, and guidance. The character has already evolved allowing for many different versions and meanings. KRBLDR: In addition to toys, what other platforms do you work on? MF: I try to do everything at least a bit. Canvas, walls, and digital are some of my favorites. Most of the time I make illustrations both handmade and digitally, but have spent much of this past year getting comfortable painting on canvas. KRBLDR: What would your ideal piece look like and what platform? MF: My ideal toy piece would be one that I had a hand in creating from the beginning . I really look forward to seeing one of my ideas made into a production piece someday. 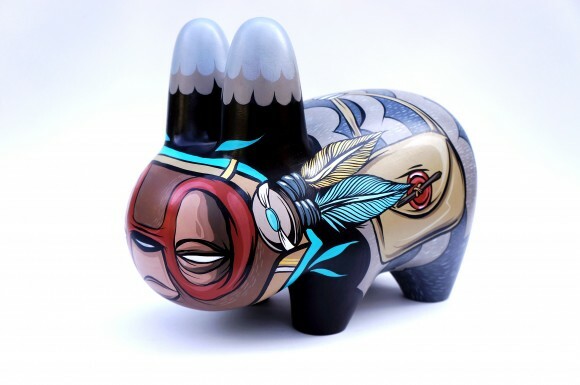 Painting a KR art giant MUNNY or DUNNY is something else I want to cross off my list. I have done some murals but I would also really like to do a very large scale piece on a wall. Something many times the size of the things I have done before. KRBLDR: In your characters the eyes are blank, what is the meaning behind this? MF: There is always a bit of mystery when the eyes are blank. Blank eyes allow for viewers to make their own ideas about what they are seeing. The first sight of characters with these eyes in my work was inspired by the amazing marble sculptures I have seen my whole lifetime from classical artists like Michaelangelo and Bernini. Those sculptors had no choice but to get the figures feelings to come out through the lines and shapes that surround the eyes. I do my best to do the same. After a lot of practice, now I feel like I have a bit more control over the characters Im creating. KRBLDR: Your work seems to emits an emotional experience for the viewer. For me, the experience is like a wave of beautiful melancholy. Can you elaborate more on what that feeling is (for you)/what you wish for the viewer? MF: In most cases I want the feeling my art gives to have more than one definitive answer. I hope to make artwork thats able to morph with the viewer. There are pieces that I make that I do want to convey a particular emotion. For myself It became a challenge to me to say what is happening in my artwork through things like color and lines. Is the over all feeling sad, angry, indifferent ? Those are the questions I ask myself while painting or drawing. Its all an attempt to make art that best represents the world that is in my mind. KRBLDR: Your lines and color pallet are SO clean! 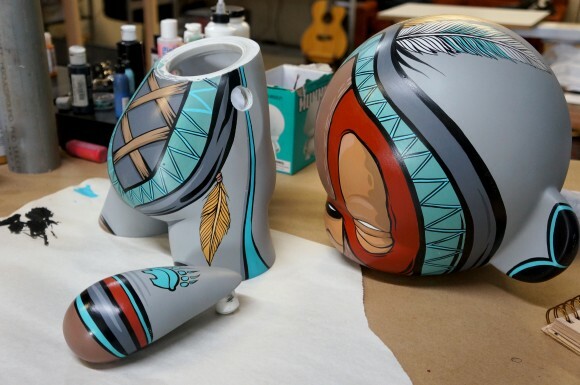 I remember you mentioned once customizing a paintbrush for a micro…. Can you talk about your technique? MF: When it comes to the color pallet its an easy explanation. For the most part the colors I use are the colors I want to see and surround myself with. They are or appear to be earth tones but I do what I can to make them stand out. It isn’t my goal to have them stand out because of color alone. I want to be more subtle than that and also not have the pieces go completely unnoticed. On the subject of lines I would say through all my artwork this is the most important part for me. Im obsessed with clean lines and tools that assist in making them. In my drawings it is my goal to make them look questionable whether they were created by hand or digitally made. There is only a couple tricks to the technique. One being long time practice and the other and harder part …patience. Making those lines takes me so long and my process does not allow for me to turn a piece of any kind of artwork that I do on a ultra fast deadline. Its very easy to customize a brush for yourself and your needs at the time. A lot of time I change or customize the brush many times before it is unusable. That happened because I couldn’t always access every brush type. At this point manufacturers make more brush types and sizes than you can think of but its so fast and easy to make what you have work just by cutting the bristles to your preference. KRBLDR: What does a day at the studio look like? MF: A day in the studio usually begins with a massive dose of caffeine, some pacing, and responding to as many emails as possible before I start warming up to paint etc… I try to get some music going as I jump from project to project. Most days I work on many different things in the same day unless Im juggling deadlines. I work late most of the time and usually get a creative boost sometime around 11 pm or so that keeps me up through the night. Im there almost all day everyday. Its my favorite place to be because all my tools and supplies are there so when a bit of inspiration comes Im able to act on it. 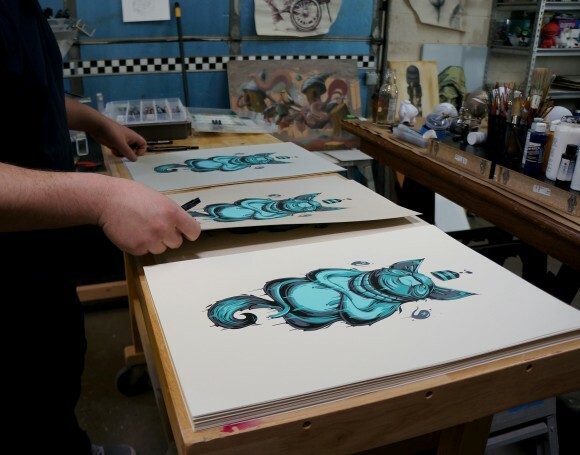 To find out more and to keep up to date on Fudge’s work, follow him on instagram @mikefudgeart and check out his website mikefudgeart.com. 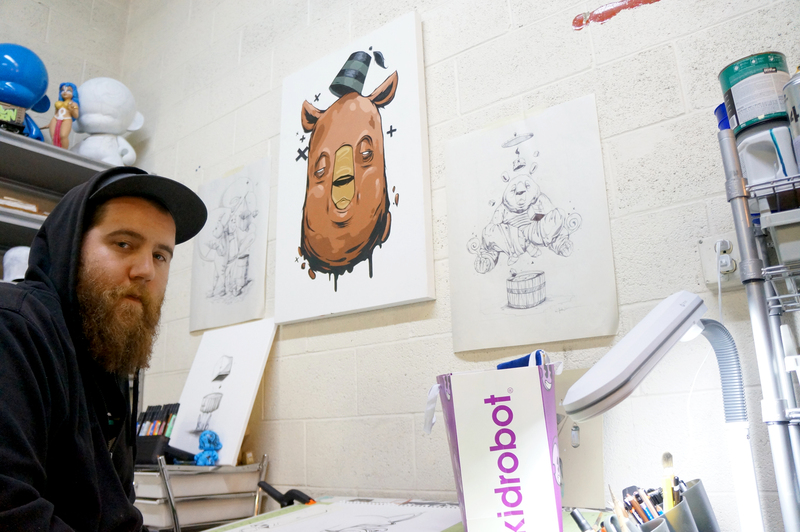 The post An Interview with Mike Fudge by Kidrobot Boulder appeared first on Kidrobot Blog.